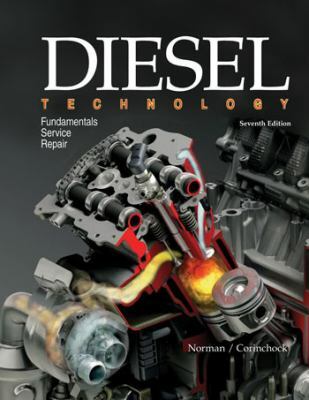 by Norman, Andrew, Corinchock, John A.
Norman, Andrew, Corinchock, John A.
Diesel Technology covers the construction, operation, service, and repair of two- and four-stroke diesel engines. This textbook details developments in engine control computers, fuel management systems, and emission control systems. Content relates to on- and off-road vehicles, as well as marine, agricultural, and industrial applications. Diesel Technology is a valuable resource for anyone involved in the service and repair of diesel engines, including those preparing for the ASE Medium/Heavy Truck Test T2Diesel Engines, Test T6Electrical/Electronic Systems, and Test T8Preventive Maintenance Inspection (PMI). -Includes the latest standards for diesel engine oils, ultra-low sulfur fuel, and biodiesel fuel. -Written in a clear, logical, and interesting manner, making it easy to understand complex topics. -Contains a detailed chapter on preventive maintenance and troubleshooting.Norman, Andrew is the author of 'Diesel Technology Fundamentals, Service, Repair', published 2007 under ISBN 9781590707708 and ISBN 1590707702. Loading marketplace prices 28 copies from $19.57 How does the rental process work?